I am home with the flu 裸 as I write this, so I have been forced to become familiar with my medicine cabinet these past few days. We’re running low on Tylenol and Motrin, our cough drops are expired, we have no mentholated chest ointment or electrolyte beverages, and I am craving chicken soup (Jewish penicillin)! Yikes! I am fortunate to have a very helpful husband (thank you, Adam! ), but what if a support system wasn’t close at hand? Wouldn’t the future sick and feverish you appreciate it if the currently healthy you made the effort to stock the medicine cabinet with essentials now? That way when you feel sick and weak, you are well prepared. My good friend has been participating in the Peter Walsh #31Days2GetOrganized Challenge on Facebook this month. Each day Peter assigns the group a different area of the home to organize. My friend enjoys giving me frequent updates and I happily cheer her on from the sidelines! Of the many organizing assignments she has accomplished this month, I think the one that surprised her the most so far was the day she had to organize her medicine cabinet. She couldn’t believe how cluttered and outdated everything was! 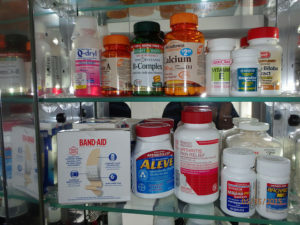 So, I ask you, “What’s in your medicine cabinet?” I know you’re thinking, ”Jocelyn, I don’t have the time or the impetus to take on an organizing project like that right now!” I understand….and my response to you is just do ONE SHELF or ONE CATEGORY (i.e. cold medicines, first aid supplies). Even a small effort to clean out and organize your medicine cabinet will provide a big benefit. It is better to start somewhere than nowhere; you can return another time to tackle another shelf/category, etc. Please write and tell me how you did, and I always enjoy hearing about the “surprises” you find! So sorry that you had to miss that GLORIOUS RCDS concert yesterday. It was beautiful, uplifting, heavenly. Back to the med cabinet, we had to go through our cabinet last week when trying to nail down decongestants and ibuprofen gel. Chaos beforehand. Less chaos now Too many pills no longer in their boxes so not sure what they are and no idea of expiration date. Time to reform habits! Fran, you have such excellent organizing instincts that with some focused attention, I’m confident you’ll reform your habits! What’s easier – trying to figure out what the pills are and label them/put away, OR responsibly disposing of mystery meds and starting over fresh with new packages of pills you use/need?